tends to pop up as she starts with a subtle dip so she is under the ball. Strength conditioning is a big factor here. Use a heavy bat on drills and regular bat at batting cage. She will have to adjust her speed but will have more power to do more damage. Remember that batting cages very seldom throw anything more than straight up strikes. Teach from a tee or live pitcher when you can for location. The biggest problem that i read in your post is aggresion. Try the tire on a pole or deflatted basketball from a tee and see if she is following through. I would personally not worry about the size of the bat as much as bat speed. I have got girls 5' 6" 163 lbs. that swing a 34/23 and crush the ball. The very next batter is 5' a buck 05 swings a 31/20 and does the same thing,but they both load up and drive through the ball with aggresion.Strength and speed in batting are directly related. Right now is a tough time to make significant changes. Have they had much instruction, or have you mostly let them find their own way? You might want to look into some of the instructional videos out there to work on getting the body into the ball more. It can help increase batspeed and aggressiveness. You might also want to check their heads, to see how they're defining success. Sometimes the coach thinks success is hitting the ball hard and the player thinks it's not striking out. Also try recording them on video, and then showing them what an aggressive hitter looks like. What a player feels and what she sees can be very different. Both DD's participated in 8 week batting clinics in the Fall and in FebMar 2008. (2 hours each)(consisted of machnine (45 mph, lefty, bunting, regular), dropper, stick/pingpongballs, hitting plastic caps. Three semi retired tRavel coaches ran these. Both girls hit great in this environment. My 9 year old has become a superb bunter. My 12 has not translated the skills and level of batting clinic performance to real game...as the season has progressed she has regressed. Part of it is attitude as she is getting little pitching time (coaches 9 year old gets more innings, new in the league) and she doesn't get infield time other than pitching (coaches 12 year old gets 3rd base alomg with a 50 lb sweet little girl who can't throw to home, nevermind 1st...but she makes coaches daughter look good ... they get 5 innings per game every game)). I'm working on that as best I can...she is treated unfairly but this is part of life and she needs to work regardless as others are watching her and she needs to get past this. People will be selecting All Stars and they are looking for the best so she needs to play her best all the time. Since this is only 25% of her problem, i'm not sure why all her efforts and performance did not translate to the games this season. She loves it and really wants to play...I'm not pushing her at all. The first thing I ask parents when they tell me a story like yours is "when did she get her eyes tested last?" If it has been 6 months, take her back. At her age, eye sight can change quickly. How tall is she? Basically a 31 inch bat should be good for her. Which bat is it? Also, can you post some clips of her swing? She has a Demarini Osterman 31" 18 ounce...likes purple. We have a Dynasty (gold) 32", 19 ounce that she used for her pitching clinics in the winter ...a bit long/heavy for her...but total was $40 on Ebay including shipping...new. We have two Finch bats around 17 ounces 29" long...ish. I don't have clips ... but I'll try to get some this week...supposed to rain tomorrow .... games scheduled Wed Sat Sun this week. Just FYI - my DD is 11 and very small. You can see a pic of her with some of her teammates HERE. She is currently swinging a bat that is 29 inches long (because she's not very tall) and 20 oz in weight. Anything lighter - she just wasn't getting good drive on the ball. She can still swing the 20oz without it compromising mechanics and anything longer than the 29 does seem a bit long for her. She also has an issue with swinging slightly under the ball when she swings and misses. She's been to a sports eye doctor because I wanted to know if there was anything in her vision that was causing her hitting issues. She does need contacts, but I think most of her hitting issues are mental. She gets too anxious to hit the ball and swings too early most of the time. Sometimes that's what causes the pop up. Other times, I think she is just trying TOO hard to hit it hard. I think because of her size she feels like she needs to put extra UMPH into the ball and that contributes to the dip of the bat head. 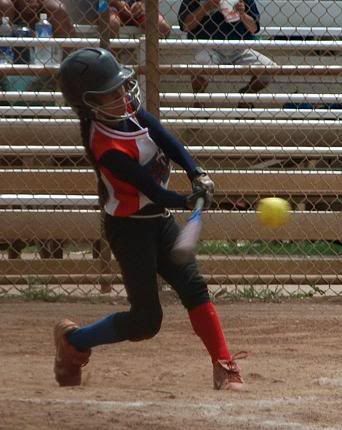 This is the pitch she did hit fair in this same at bat...obviously it ended up being a pop up and she got out. And yes, you hitting gurus are free to critique, I don't mind. Ok, how did you post those photos in your post? I tried to do that before and couldn't. Top swing looks pretty good. Bottom one she let her elbows get ahead of her hands. Ah, the consistency of an 11 year old, eh? Doing a good job of throwing herself into it though! I have found after much trial and error that bat speed is really what makes the difference in driving the ball with power. I bought a swing speed radar, (about $100.00). Money well spent. I did a test with my team before BP while they were fresh. I tried different weight/length bats hitting the same pitch from a machine, and measured their swing speeds. To keep this short, the outcome went like this. 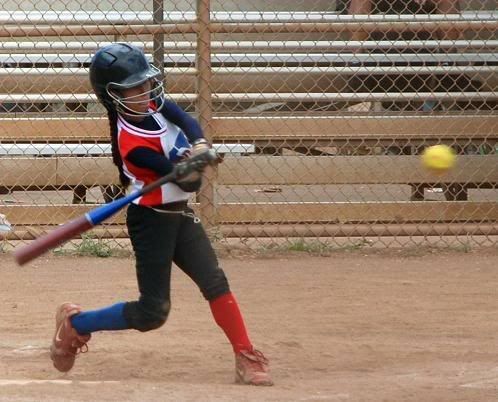 Each girl has different phyisical strengths, to match her with the proper bat we found that the heavest bat that did not cause a decrease in her swing speed was also the bat that delivered the hardest hits. I know this is not new news but it demonstrated to the players and parents what is important with a bat. I also work with a NPF player who recommends that younger players stay away from end loaded bats. The reason is, until they have a swing that is repeatable a large persent of the time, an unbalanced bat tend to change their posture during the swing, which leads to all kinds of problems. Hope this helps you in your "swing studies" there is alot of info out there, study long and hard, and try to learn what the best hitters in the game are doing.